“Karma” – or donation-based – classes have been on our schedule since we opened in 2008. 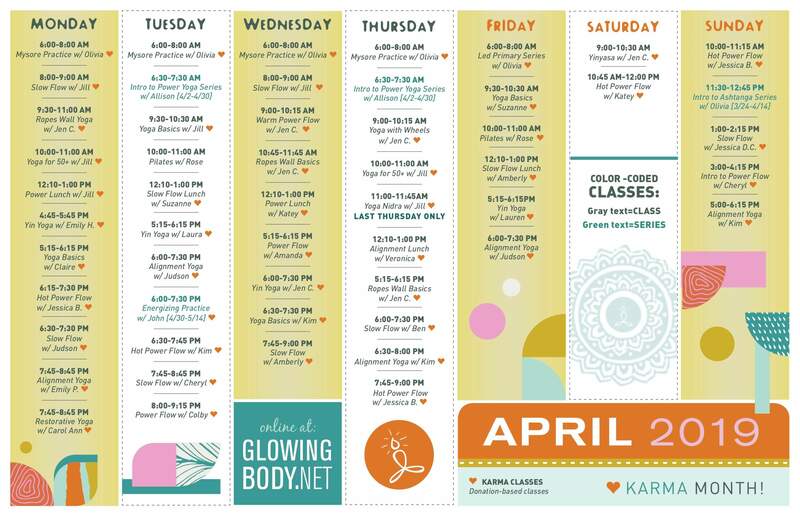 This April, Karma classes are taking over the schedule! Our teachers have elected to offer 50+ classes a week by donation to the public. View the Karma month schedule. Why are you offering Karma Month? Though yoga has become a booming for-profit industry along with other wellness services and products, most yoga teachers have a heart for teaching that means more to them than income. “Karma” is a Sanskrit word that means “action”. In this particular context, we are taking the perspective that sharing yoga can have ripple effects throughout the community. We are treating this as a timed, concerted effort to share yoga, which for us, has been a positive force in our lives. We believe it will benefit others too. Does this mean classes are free? No. Consider this a social experiment and community service project you get to be part of! When you walk in to take a class, you will be asked to provide a donation, instead of being told the price. The expectation is that the generosity of some students will supplement the restrictions of others. It is requested you place value on the classes offered, even just $1, if that is what you can afford, however no one will be checking whether you contribute or how much you contribute. It is recognized that for some, the value they place on what is offered may be purely internal, and we welcome your presence as your contribution. What donation amount is suggested? Our standard drop in and class card rates range from $10-$22. During Karma Month, the classes are the same quality as always, so this is the suggested donation amount. As stated above, no one will be checking whether you contribute, or how much you contribute, so it is truly up to you. All students must check in at our front desk before entering class. Donations will be collected at the desk prior to class. Students who have purchased a class card will still able to redeem them. You may also make donations with cash, credit card, or check. I have a class card. Can I keep using it during Karma Month? Yes! You may also request to hold your card for the month of April, and your card expiration will be extended by a month. Just tell staff at the desk what your preference is! Which classes are Karma classes? The April schedule will be released this week! Only classes marked on the April schedule as “Karma” will be available by donation. This does not include workshops or series, unless specifically indicated as such. On our monthly schedule, classes with a ❤ or which say “Karma” beside the name are eligible for donation-based pay. I have never been to Glowing Body before. What do I do if I want to take a class? Just show up! Wear comfortable clothes. Arrive 15 minutes early if it is your first time at the studio. All students must sign in at our front desk; new students are required to fill out a brief form. You may bring your own mat, or borrow a studio mat, at no charge. Class sizes are limited and will be filled on a first come, first served basis. What happens when Karma Month is over? 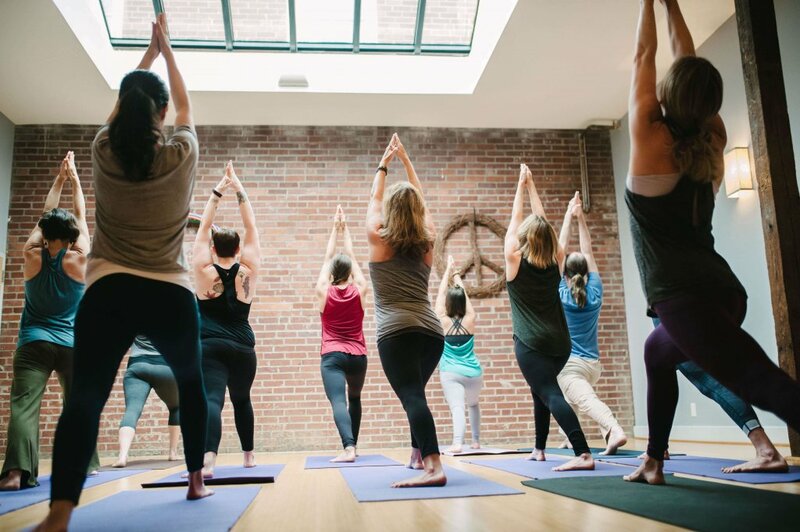 Though Karma Month will only last for April, yoga students facing challenges paying for classes may appreciate 10+ weekly Karma classes – including styles from Restorative to Power, as well as recurring meditation courses – that have been and will remain on Glowing Body’s weekly schedule. Further, there are lower cost options, like early morning and lunch classes for $10, class cards, and discounts for college students and seniors (65+). You may reach us at info@glowingbody.net or 865-545-4088 with additional questions.